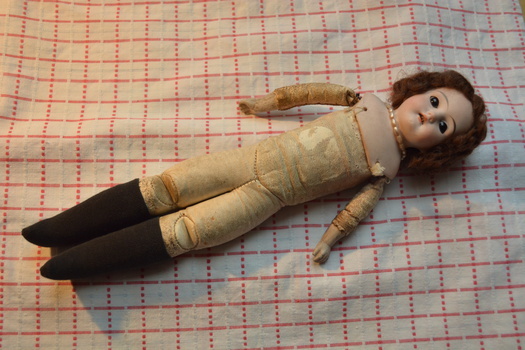 Small bisque-headed doll (28cm/11") marked only "15/0" on the back of her neck. 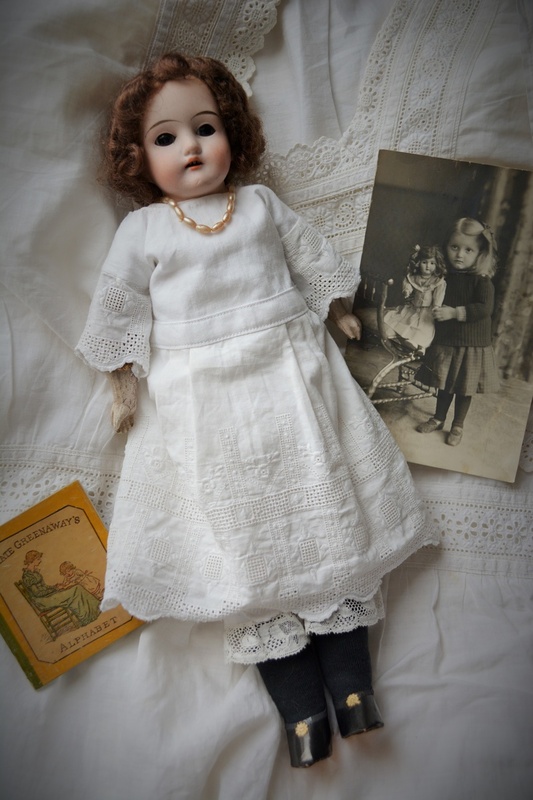 She has fixed brown glass eyes, a very fine antique curly mohair wig, china lower arms and a leather body with black cloth lower legs. Her bisque face is a little rough but very pretty, her leather body is jointed only at the shoulders and knees so she cannot sit. Her cloth toes were completely worn away and leaking sawdust, so she has been given new black cotton feet and legs, handsewn on over the original material and the feet stuffed with organic cotton wadding. She is dressed in new clothes (stockings, drawers, chemise, dress) made from old, vintage and antique cotton. She came wearing her necklace of pearl-effect glass beads. The paper shoes are vintage or antique from old stock. 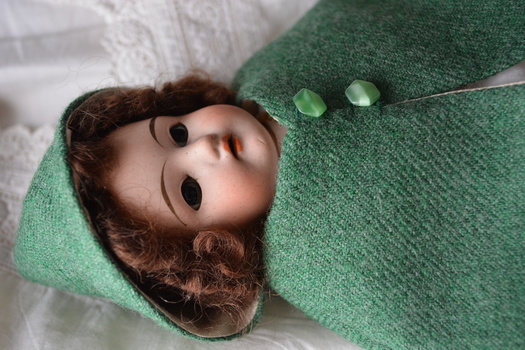 She is a bisque shoulder head doll with a Dolly face . Could you look at back of her neck for more marks under her hair I am guessing you may see a AM . She dates around 1900-1930. Tell me her markings ok . Her body is a kid leather and cloth vs a hard composition body you could pose . the 15/0 is size number only . Her hair has to be covering other marks Like Made in Germany and symbol or letters. She's beautiful and I love the first photo. Thanks for sharing! Her eyes look like they should sleep and would have had real eyelashes on top . They don't bulge like they were meant to be stationary ? I see now the missing painted lower lashes at least but she may have got out of factory without that being noticed ,since these were mass produced toys imperfections could have been missed . I agree without looking at head she will remain unknown Dolly Face Bisque Doll . Thank you Jewels and Manikin for the comments. Interesting Point about the eyelashes being missed, Manikin. Thanks again!